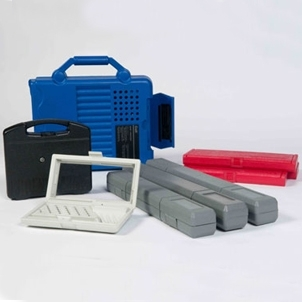 A blow molded case is a lightweight plastic, and protects medical products, fragile instruments, OEM applications, and audio and visual equipment. The interior is customized foam, and organizes, protects, and presents the product. Custom case orders for any amount of pieces are attractively priced with Western Case, tolerate low and high temperatures, are nearly unbreakable, rustproof, resist chemicals, scratch resistant, and dent-proof. They are available for carrying, display, storage and shipping cases. A blow molding process is used to create these cases. Blow molded cases are made with a double wall construction. The in-house design team provides assistance with designs and complete customization. The case is guided from concept, to production, to completion for the highest quality product. A custom interior mold and stock mold have a much lower cost than a new tool. These cases are offered in numerous colors, and stamp decorations for the lid are available. These cases are used for sample kits, industrial equipment, sales kits, medical equipment, tools, and audio and visual equipment. The cases are lightweight, rugged, offer design options, and foam interiors. An order of 500 pieces offers logos, and over fifty stock sizes are available with a low charge for set-up. Blow molding is accomplished with machines. The plastic is melted, then formed into a preform or tube. The blow molded case is available in a variety of shapes, and the outside is often rectangular. The extrusion blow molding type of process for blow molding are used by Western Case, and the results are in high quality.